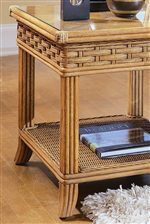 Enhance the side of your sofa or chair with the refreshing style of this end table. Exposed wood with reeded detail and a glass top compliment the woven designs, while one shelf offers a wonderful space for reading material. Arrange with a matching cocktail table, sofa, and chair for a polished look. The 953 End Table with Shelf by Braxton Culler at AHFA in the area. Product availability may vary. Contact us for the most current availability on this product. The 953 collection is a great option if you are looking for Tropical Tropical furniture in the area.